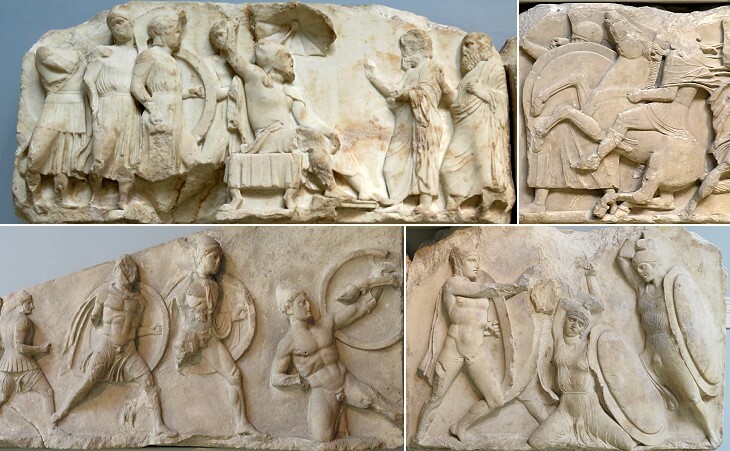 b) the long period of Roman rule; at first Xanthos was assigned to the King of Pergamum, an ally of the Romans; when in 133 BC Attalus III, its last king, bequeathed his possessions to Rome, Xanthos became part of the Roman province of Asia. It enjoyed a period of great prosperity in the Ist and IInd centuries AD as the arch built in honour of Emperor Vespasian proves. 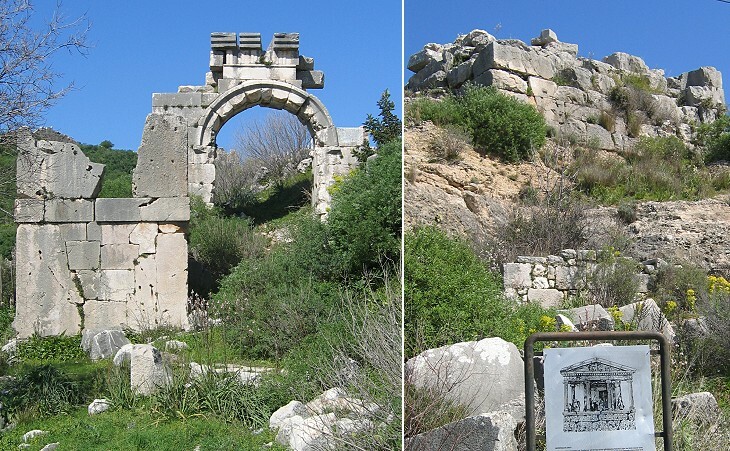 The gate, in addition to being the main entrance to Xanthos, was the starting point of a sacred road leading to Letoon, the site of the most important sanctuary of Lycia. The Nereid Monument was located very near the gate. In 1839 British archaeologist Sir Charles Fellows published A Journal written during an Excursion in Asia Minor, an account of his explorations of the River Xanthos valley where he discovered the ruins of ancient cities: Patara at the mouth of the river, Xanthos on a hill nine miles inland and Tlos in the upper valley. Fellow's book attracted the attention of the British Government and of the British Museum; the Sultan was asked permission to ship to England a certain number of works of art found in Xanthos and Patara. 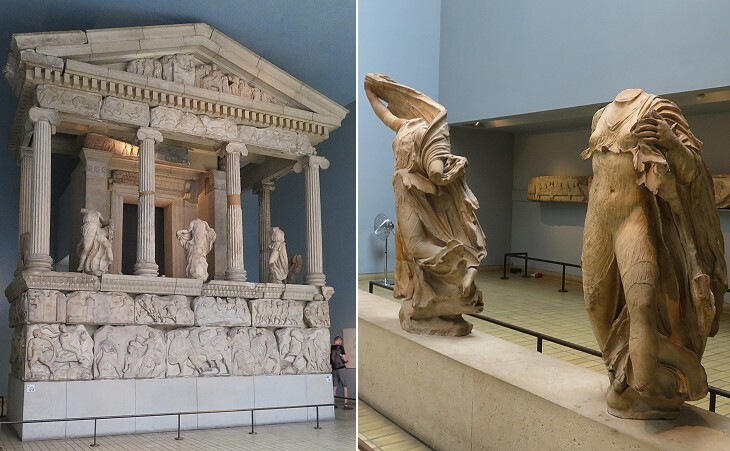 In 1842 a tomb shaped in the form of a small Ionic temple was carried away and reconstructed in the British Museum. It was decorated with statues of the Nereids (sea nymphs who helped sailors). Eventually the monument was identified as the tomb of Arbinas, satrap (Persian governor) of the region. 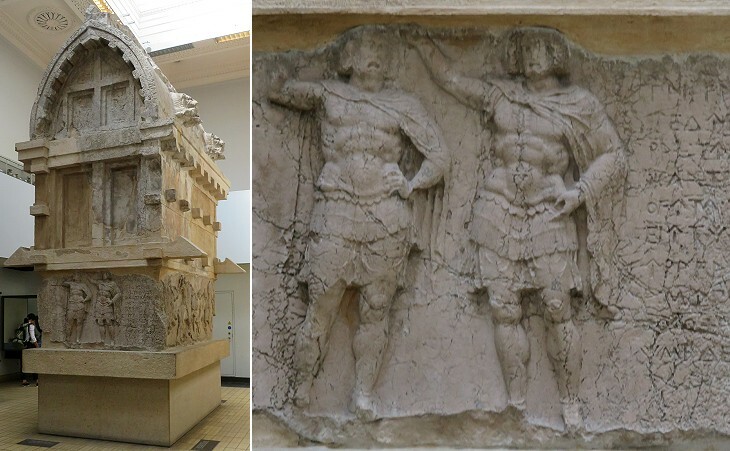 The reliefs which decorate the building mainly show traditional scenes of combats, but in one of them Arbinas is portrayed seated under a parasol while receiving dignitaries, a depiction which is very similar to those which can be seen in the palaces of Persepolis. Rome and most of the cities of the Ancient World had rules which limited the construction of funerary monuments inside the city walls. Lycians held a different opinion on this matter and the wealthiest citizens were allowed to build their monuments right in the centre of the city market. In Xanthos two monuments which stand between the theatre and the agorà have become the landmark of the archaeological site. Fellows described this tomb as "Gothic-formed Horse Tomb" and it is generally referred to as the "Gothic tomb". Apart from a reference in an inscription we do not know anything about Payava. He might have been the successor of Arbinas and the tomb is dated ca 360 BC. The other tomb is named after its reliefs. Harpies were winged death-spirits; since souls were believed to fly off in the form of birds, Harpies were pictured as birds of prey waiting to catch and secure them. The current theatre was built in the IInd century AD, most likely on the same site of a smaller theatre which was cut into the rock. The new theatre was supported by thick walls and two archways facilitated the access of the audience. Only the upper rows of seats are missing as they were used at a later time to build defensive walls. A colonnaded street crossed the whole market area; in this part of Xanthos there are some pedestals which supported statues and a tall pillar tomb with a very long inscription in the language of the Lycians (which has yet to be fully understood). The many tombs of Xanthos have different shapes, although those having a "Gothic" lid are the most frequent ones. The archaeological area of Xanthos is divided by a local road: its eastern part is still being excavated: it shows evidence of the Byzantine period: a large basilica with mosaics (currently covered - March 2008) was built on the site of an earlier Roman temple. Xanthos has only a few rock-cut tombs which are located at the top of a hill opposite the theatre; these are among the oldest tombs of this kind; unlike the later examples of Kaunos, Telmessos and Myra they were not shaped like a small temple. 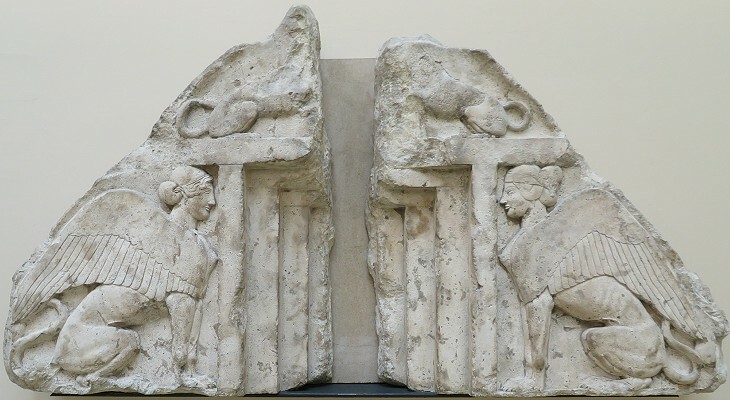 Although the finest works of art of Xanthos have been moved elsewhere, yet there are still some very elaborate reliefs which deserve being admired, such as that shown in the background of this page.